Summer is great. You can just open the back door and let them run around the garden, or cart them off to the park, and most children will be able to amuse themselves, at least if there are two or more together. But what do you do with them in winter, whether you want to keep up their connection with the natural world, or simply exercise them so they will sleep at night? Cold weather isn’t too much of a problem for them. Children will naturally be very active, so keep themselves a lot warmer than you and me as we stand and watch them racing about. 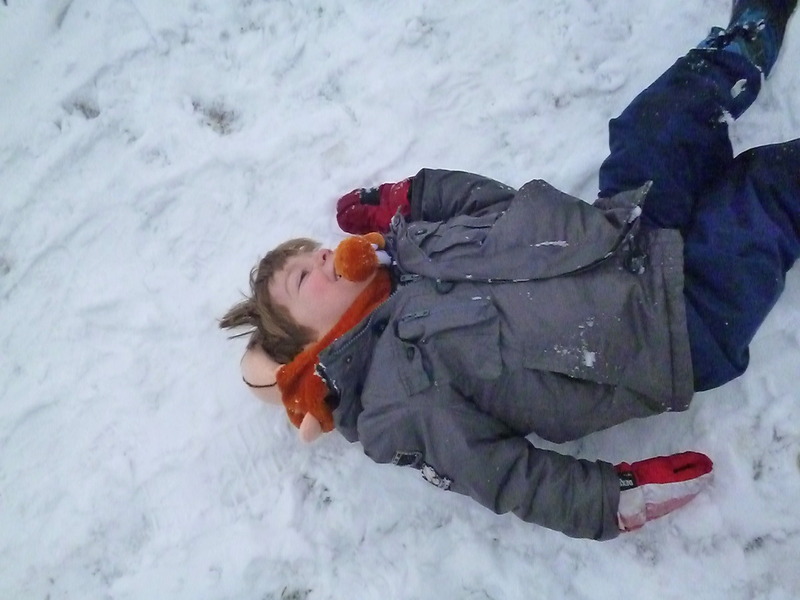 If it snows, you’re laughing…kids love snow. You can still go to the park, just for the novelty factor, to see what it looks like all snowy and reminisce over what it looked like in summer. 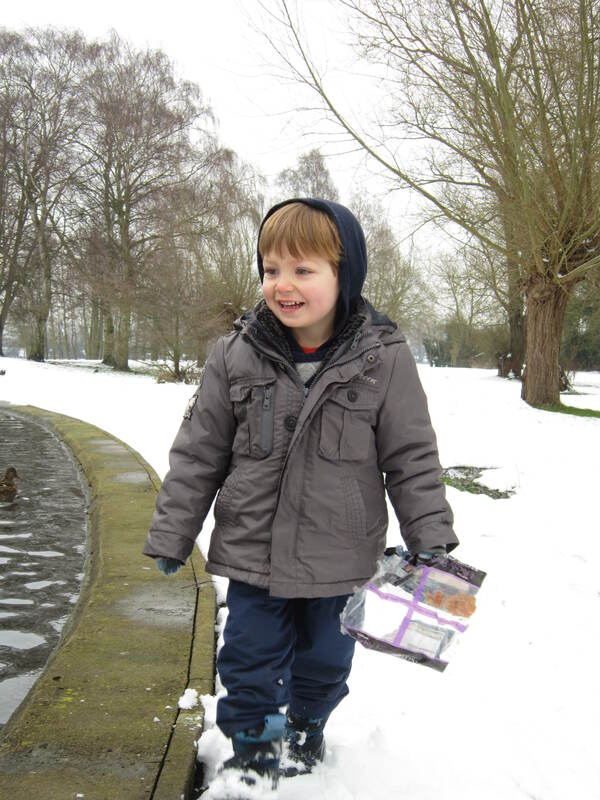 It’s impossible to see if the duck pond is really frozen over from a distance, and you can take some bread to feed the ducks – this appeals to children’s kinder nature. 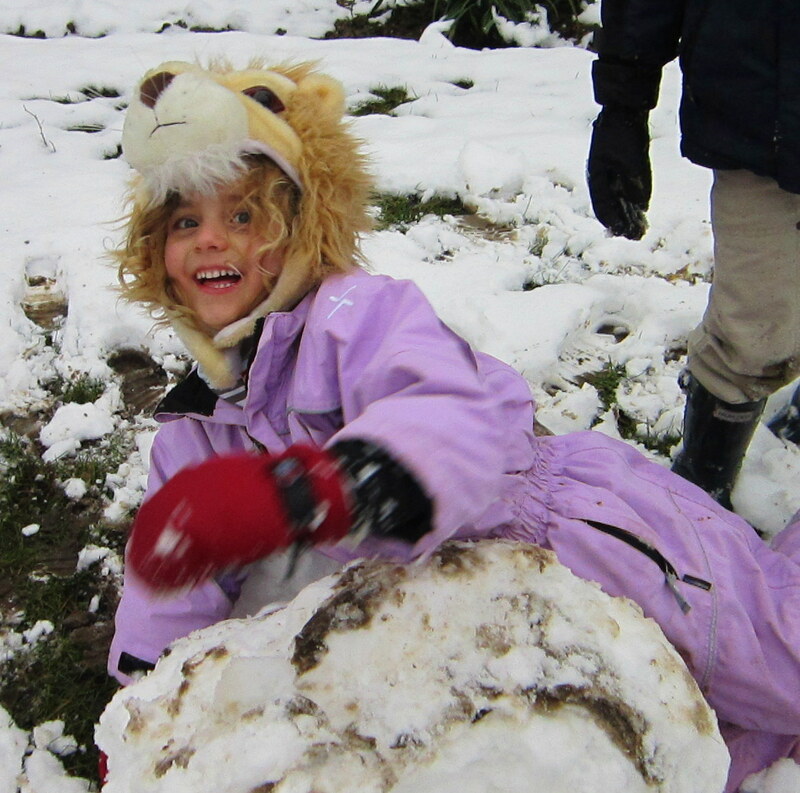 Good for snowy days, snowsuits essential. Get them to all cooperate in a team effort to make a giant snowball, and then try to roll it up a hill to see if it will collect more snow and get bigger as it rolls down. Of course you know that (a) they will never manage it, and (b) it will break into smithereens if they do, but it is hysterically funny watching or taking part. 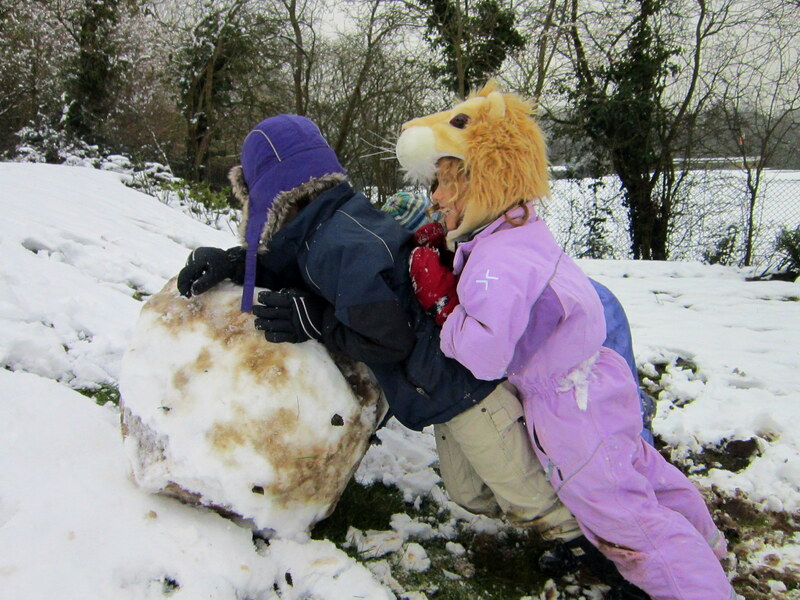 (I responded to cries for help and ended up in fits of laughter helping shove the snowball uphill). 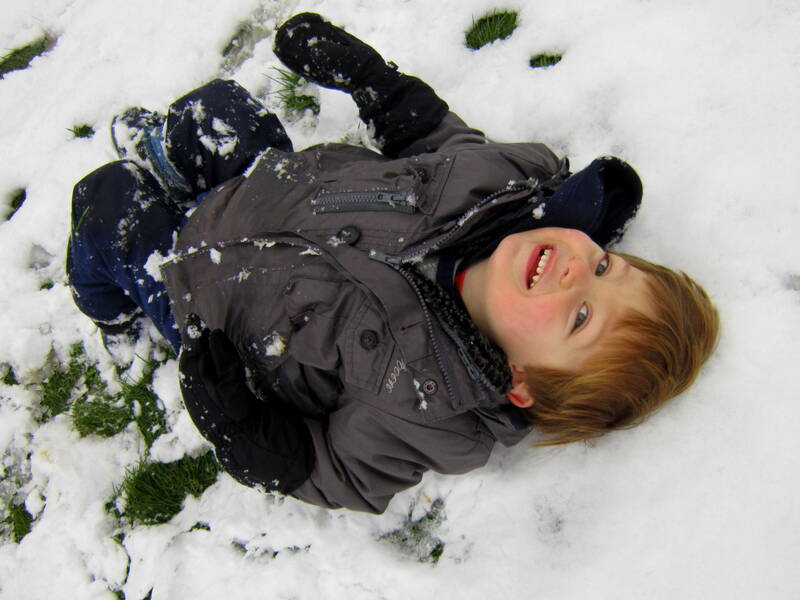 Again, warm waterproofs or snowsuits dramatically lengthen the amount of time they can spend outdoors. A car is easier to make than a snowman, being low to the ground. 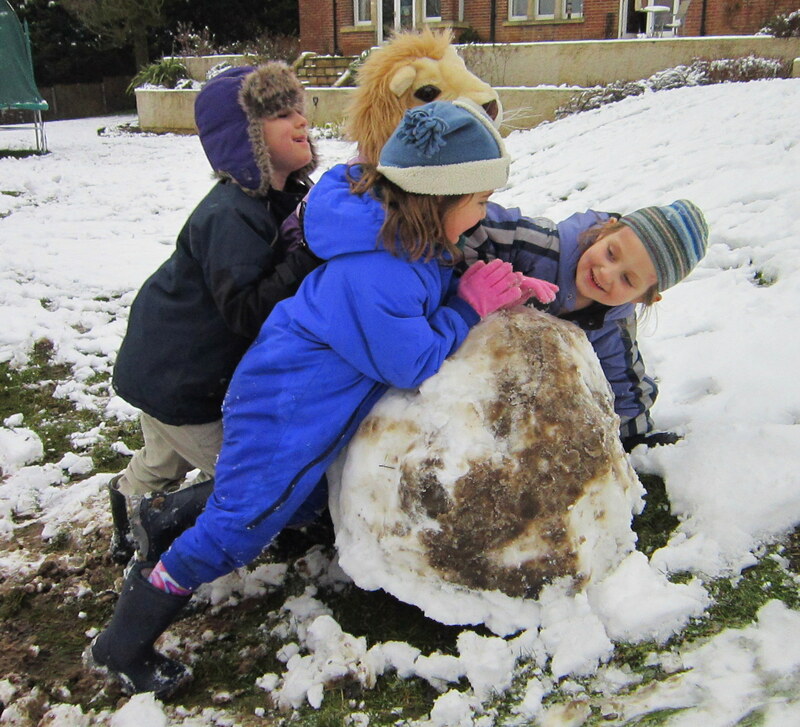 Really any lump of snow will do, with smaller snowballs for wheels, but you can help them make a little enclosing structure like the start of an oval igloo, with heaps of flattened snow inside for seats. Then they can play a variation of “We’re off to Africa” (see Free Entertainment). If it doesn’t snow, but it’s really cold, wet or otherwise inhospitable outside and you’ve done baking and Hide & Seek to death…well, after Hide & Seek in the dark and other variations, my favourite diversion is either getting out one of my Discovery Boxes or making a new one with the kids. A favourite with the little ones is Sensory Trays, simply a tray of sand, seeds or salt. Otherwise feel free to try any of my Play and Activities from the top menu. Den building is always a good idea and can last for hours, and you can vary it by suggesting they build a shop, airplane or bus. Then you have to join in and be a customer! Another opportunity to jet off to Africa! My staple den building kit is blankets or lightweight tarps, bungee cords, clothes pegs, larger strong pegs and clips, paracord or rope, and clothes horse or other lightweight props. Organising a treasure hunt can be heaps of fun too. The simple way to do it is hide loads of glass pebbles (or chocolate buttons) all over the house when they’re not looking, and then shout “GO!” Or you can go the whole hog with clues, perhaps putting on a short video to distract them while you first hide a small toy, then work backwards with the clues, writing them as you go. (Simultaneously write yourself a list of where each numbered clue is hidden, so you don’t get confused and the kids don’t lose the trail.) Remember to make the clues simple but educational, to help the kids practise their spatial awareness: (“On top of something big and wooden”, “under something fuzzy and pink”). The first clue tells where the treasure is, the second tells where the first clue is, etc. They will follow them last clue first. Always keep clues within child eye level. If you have a lot of kids, they can be split into teams, with a mix of ages in each team. The older one acts as ‘clue reader’ and younger ones are ‘followers’. To avoid ructions, stipulate that each child has to have a turn finding a clue. Yes, it sounds complicated. But with practice, it gets easier. Maybe save it for parties and special occasions. If they’re really getting on each other’s nerves and the kids need a more physical game to burn off some excess energy, I have found a winner in getting them to stage a talent show or circus. I usually have time to cook lunch while they fart about organising their show, then we eat and discuss show ideas, and afterwards they use up the extra food energy in staging the performance while I watch and clap! I make everybody take turns saying something nice about each performer’s act before it’s time for the next one. If it’s above zero and really wet outside, never underestimate the joy of zooming bikes through huge puddles, or daring each other to ‘step in a puddle right up to your middle’ to see if it comes over the tops of your wellies. Don’t forget head to toe waterproofing.